The late Hon. 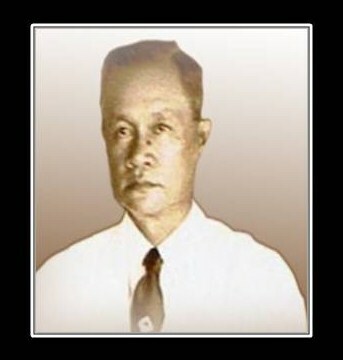 Jacinto P. Elpa is of an Ilocano descent. He was born in Barangay San Gregorio, Lapaz, Abra on September 8, 1890. After finishing his primary and intermediate grades in Abra he went to Vigan, Ilocos Sur where he finished High School. Then He went to Manila to look for a job. As a High School graduate he was by then already qualified to be a teacher in primary schools. He was told of an opening as a teacher in the province of Surigao. Without hesitation, he grabbed the opportunity and at once embarked on a journey to the then undivided province of Surigao. Not long after his arrival in the said province, he was accepted and assigned as principal of Tandag Public Primary School. During this time, circa 1915, there were no Public intermediate and High Schools yet in Tandag. These schools were only found in the capital town of Surigao (now Surigao City, Surigao del Norte). In the year 1916, he got married to Eliodora Delicona, daughter of Don Policarpo Delicona, a prominent individual in the community. After the wedding, he retired from his job as principal and educator taking the advice and prodding of his stepfather that he may administer the latter’s vast properties in the municipalities of Tandag, Tago and San Miguel. In the early years of 1920, he entered politics. He was elected successively as Municipal Councilor, Vice Mayor and Mayor of Tandag. In 1938 he run for a higher post as Board member in the yet and still undivided province of Surigao and was eventually elected, i.e., together with the Hon. Pedro Coleto as Governor. By this time, there was no Vice Governor yet and there were only two board members with the governor composing the Provincial Board. After his term as board member, he retired from politics. During his long years in public service, the Hon. Jacinto P. Elpa was never tainted with any anomalies, irregularities and corrupt practices. He was a dedicated, reasonable and honorable public servant who was fondly missed and remembered very well by his colleagues as an exemplary one, particularly as a staunched advocate in educating the youth in the province of Surigao. On May 1, 1968 at the age of 77, he died of heart attack in Cebu City. His remains was brought back to Tandag and buried at Tandag Catholic Cemetery. In 1981, the Tandag Provincial High School (TPHS) was changed into Jacinto P. Elpa Provincial High School by a provincial board resolution under the administration of Gov. Gregorio P. Murillo, Sr., in honor of the late JACINTO P. ELPA in recognition of his outstanding record in the field of Education, community development and long creditable record as public official. Finally, in 1989, Jacinto P. Elpa Provincial High School became Jacinto P. Elpa National High School (JPENHS).